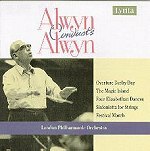 You can bet your bottom Euro that William Alwyn’s Elizabethan Dances is one anniversary that will almost certainly pass unnoticed by the vast majority of music listeners in 2007. It is fifty years since this work was first performed at the BBC Light Music Festival at the Royal Festival Hall. It would be easy to justify ignoring this work if we assumed that it was simply a piece of ‘light’ music that was largely ephemeral or belonged to a more innocent era. However, there are four reasons why this view is wrong. Firstly, there has been a huge rise in the awareness of ‘light music’ over the last ten years. Record labels including Naxos, Marco Polo and Hyperion have issued a large number of important and entertaining CDs, however pride of place must go to the ever-growing catalogue from Guild. Secondly, William Alwyn is one of the United Kingdom’s most important composers in spite of the fact that he is little known in the world-view of Classic FM producers (David Mellor being an honourable exception). The fact remains that few people will have managed to avoid hearing his music. This is largely because of Alwyn’s huge film score output. We need only think of Carve Her Name with Pride, A Night to Remember and Odd Man Out to mention at least three films that will endure till mankind is no longer amused and entertained by moving pictures. Thirdly, the quality of this particular piece of ‘light’ music is second to none. This is a work that exhibits the highest degree of invention, imagination and sheer craftsmanship. To quote Christopher Thomas’s review on MusicWeb – "to describe this as light music would be potentially to trivialise the quality of the composer’s work." And lastly, in spite of the unsurprising fact that it is not programmed for this years Proms it is easily available on three excellent recordings. The 1950s were an interesting, if somewhat stressful, time for William Alwyn. He wrote in his autobiographical book, Winged Chariot, that he often wondered how he had coped with this hectic period of his life. He had been in constant demand for important film scores which required a vast amount of music. He recalled that, in spite of the hard work, he was grateful that he did not have to spend long hours teaching or equally long hours of practice needed to maintain instrumental virtuosity as a concert performer. At this time Alwyn was seriously involved with the Composers' Guild of Great Britain – "meetings of every kind, serving on and chairing committees," etc. etc. In addition he suffered health problems which seem to have led him close to nervous breakdown. It was at the turn of the decade that he finally decided to stop writing for the cinema. Alwyn was to complete his last film score, The Running Man, in 1961. Bernard de Nevers was the director of Alwyn’s main publisher, Lengnick: he was also a close personal friend. In the late 1940s de Nevers had persuaded Malcolm Arnold to compose the well known English Dances. This was in response to a suggestion that Arnold should write a suite of music akin to Dvorak’s Slavonic Dances or perhaps Bartók’s Romanian Folk Dances. Six years later, he suggested to Alwyn the ‘Elizabethan’ theme of the present work. The composer had already received the commission from the BBC however it was de Nevers who was largely responsible for the direction and mood of this work. William Alwyn had previously composed a series of Scottish Dances in 1946. These had been dedicated to the ubiquitous film music composer and conductor Muir Matheson. It was a seven-movement work that has been described as a pastiche of Handelian Scottishry! Each one of these movements is quite short, entertaining and straight to the point. They are fun and reflect a very Scottish way of celebrating – the whisky bottle is never far away, although the slow movement is romantic and quite sober. The following years had seen a succession of works that could hardly be described as ‘light music.’ There had been the first two symphonies, the Magic Island Prelude and two concertos. In 1955 there was the radio opera Farewell Companions; the following year saw a number of important works including the Fantasy Waltzes for Piano Solo, the Moor of Venice Overture for Brass Band and the magnificent Third Symphony. This was a "stormy and passionate work, strongly rhythmic in the outer movements but finding tranquillity and repose in the ‘adagio’ and in the closing pages of the symphony." It was first performed at the start of the 1956/57 orchestral season when Sir Thomas Beecham conducted the BBC Symphony Orchestra. In parallel to the ‘art’ music, Alwyn had worked non-stop on film music. Perhaps the best known scores of those years were The Ship that Died of Shame, The Million Pound Note and The Malta Story. It is interesting that the Elizabethan Dances was the only major non-film piece to be written and performed in 1957. Film scores from this year included The Smallest Show on Earth and Fortune is a Woman. The Elizabethan Dances was first performed on 6 July 1957 at the Royal Festival Hall during the 1957 BBC Festival of Light Music. The composer conducted the BBC Symphony Orchestra. The work is some sixteen minutes duration and is scored for a standard orchestra with an exotic array of percussion including castanets, wooden blocks, maracas, celesta and harp. Other works produced at that Festival included Rhapsody & Rondo for Horn and Orchestra by Ernest Tomlinson, Malcolm Arnold’s Scottish Dances and Charles Spink’s Concert Toccata for Organ and Brass. The enjoyable London Transport Suite by Sidney Torch and the Cornish Holiday for Brass Band and Orchestra by Dennis Wright added to an impressive programme. Both the Spink and the Wright are unavailable on CD. A Morris Dance – or perhaps a "Mock Morris Dance"
Alwyn himself wrote that the title refers to the reigns of both Queen Elizabeths. Unlike Eric Coates’s Three Elizabeths Suite it does not signify the Queen Mother - however much the more reflective music could suggest ‘Lillabet,’ her girlhood and her childhood home and family. Alwyn is at pains to point out that the music is not an attempt at pastiche: he does not wish to imitate the music of the two periods but rather to nod in their direction. Nowhere is contemporary ‘pop’ music quoted or even alluded to – and remember that Elvis had sung Heartbreak Hotel around the time this work was being composed! Furthermore, I feel that Alwyn is being a little disingenuous when he suggests that the second dance is a "lilting and seductive modern (my italics) waltz." It would have been little recognized as being ‘hip’ by the young café society in London or Manchester! The first movement is quite definitely a 20th century film composer’s recreation of the ‘pipes and tabors’ of Queen Elizabeth’s court. Yet even here the mood is more 1950s than 1550s! Full orchestra is used with great imagination: a surprise upward harp scale reminds us more of the Tudors as seen through Ralph Vaughan Williams’s eyes and ears. The Waltz as noted above is ‘modern,’ yet it not a work to dance to. If anything it is a miniature tone poem evoking a depth beyond what was typical of ‘light’ music of the day. It has been described variously as being ‘languorous, lilting, suave, insouciant, beguiling and very easy on the ears.’ Barnett even suggests that it has the "psychological reach of a Prokofiev waltz." I find it an evocative and deeply reflective movement that belies its two minute duration. There is no way that any 13th century Morris Dancers heard anything like the attractive third movement. Once again it is the past seen through the lens of Hollywood or Ealing. The main tune is presented by the bassoon before being repeated by the flute and then the strings. Percussion adds an exoticism that distances this dance from its historic frame of reference. William Alwyn rarely nodded to popular music in his ‘art’ music. Yet the fourth dance is a definite exploration of ‘the blues’: Bernstein would have enjoyed this. Maracas and castanets give it a kind of international feel. The tune is presented firstly on the violins before a great almost Gershwin-like full orchestral climax brings the movement back to a more reflective mood. I detected hints of Ravel here too! Yet soon the boisterous music returns with a great splashy sound before closing enigmatically. This is the longest of the dances. The moderato is the heart of the work. It is ostensibly a Pavane which is supposed to suggest the viols and recorder consorts of the 16th century. However, if one did not know the source of this piece, if one was listening to it with an innocent ear, it would certainly be seen as a contemporary work – if a wee bit old-fashioned. The last movement is quite definitely the big finish that would be required of a work written for the Light Music Festival. Alwyn noted that it starts as a hornpipe and was intended to continue as such – yet something went wrong – it suddenly turned into a kind of Rumba! Lots of brass and the entire percussion department give the movement a lively and impressive conclusion. There are three recordings of this work currently in the CD catalogues. The earliest is conducted by the composer himself. Unfortunately he did not record all six dances for Lyrita: he chose to omit the third and fourth movements. In 1992 Chandos recorded the entire work with the London Symphony Orchestra conducted by Richard Hickox. The programme notes for this CD were written by the composer’s widow. The latest, and to this listener’s ears the finest recording is from Naxos: David Lloyd-Jones convincingly conducts the Royal Liverpool Philharmonic Orchestra and appears to best represent the shifting moods and reflections of this work. Deryck Cooke reviewed the score which was published by Lengnick in 1959. He notes that the music was an ‘amalgam of imitation Tudor and modern popular idioms,’ without further comment. However he states that the modal waltz – No. 2 was, in his opinion a failure. He believes that the two principal melodies were unconvincing. He is impressed with the other five dances stating that they are successful. He reserves special praise for the final "mixture of country dance and rumba." Listening to this work half a century after it was first composed and performed brings to mind two comments. Firstly this is hardly ‘light music’ in the sense of the ‘potter’s wheel’ type of interlude that was once so popular on TV. This is music that has a considerable depth: virtually ever movement could be presented as ‘art’ music. It quite definitely belongs to the concert hall rather than the soundtrack of a 1950s advert for ‘Holidays in Devon’ Secondly this is a well-crafted piece that exemplifies good composition, fine orchestration and rigorous stylistic balance. It is definitely not pastiche: generally speaking its mood is quite up-to-date if not contemporary.